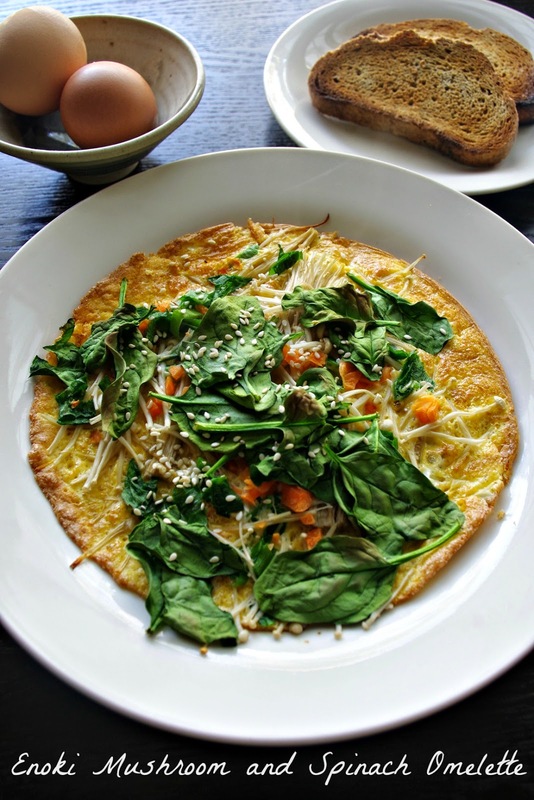 If you are planning on making breakfast or brunch for someone special this weekend and you'd like something healthy and tasty that looks more impressive than it really is, then this recipe is for you. The enoki mushrooms bring a little 'fancy' to the dish yet it all comes together quickly and easily. I love buying a different ingredient at the fruit and vegetable market, it makes me excited to cook something new. This week it was these enoki mushrooms that caught me eye. Inspired by Growling Belly they make a great addition to an omelette. To prepare them, cut off and discard the bottom ends. Then cut them again into thirds. Finely dice some carrot and slice some spring onion and you are just about ready to go. Whisk four eggs in a small bowl and add a teaspoon of soy sauce. 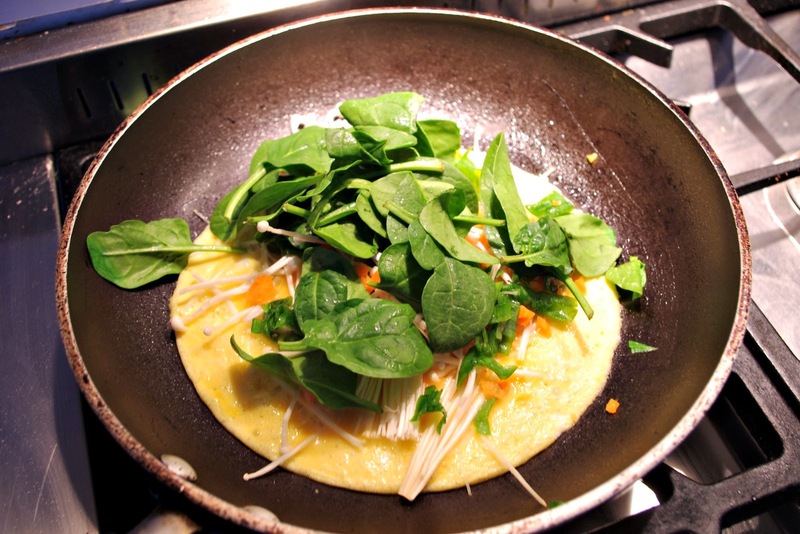 Spray a pan with cooking oil and cook the egg mixture until half-set. 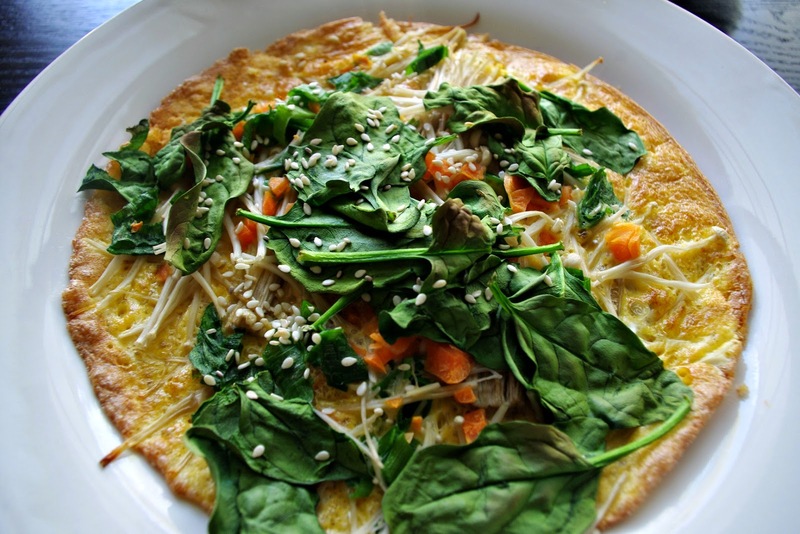 Top with carrot, spring onion, enoki mushrooms, a sprinkle of spinach and some sesame seeds. Finish the omelette in the oven under the grill get a crisp and golden edge. The carrot adds great texture and the mushrooms provides an earthiness that complements the eggs nicely. Pre-heat oven grill to 200 degrees celsius. Cut carrot into fine dice and finely slice spring onion. Whisk 4 eggs in a small bowl. Add soy sauce and mix well. Spray non-stick fry pan with cooking spray and heat pan over high heat. Add half of the egg mixture and cook until half-set. Top with half of the carrot, spring onion, mushrooms, spinach and sesame seeds. Place pan under the oven grill and cook for 3-5 minutes until the edges are crisp and golden. Repeat to make second omelette. Season to taste and serve with rye toast. What do you cook to make a fancy brunch? Gosh this looks delicious! 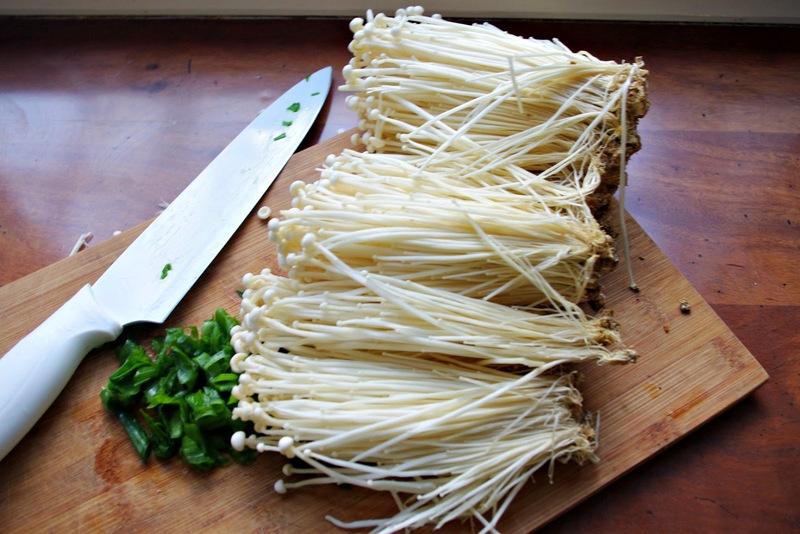 I've never cooked with Enoki Mushrooms before, must keep my eye out for them. Thank you for linking up with us for Fabulous Foodie Fridays. I haven't seen these mushrooms before either, but this recipe looks so tasty! My toddler is currently eating lunch besides me and started pointing to the screen and saying 'yummy, yummy, yummy' when I was looking at the photos. Haha, I guess it looks nicer than what he's currently eating. I'm impressed by your toddler's food palette, if this is the type of food he gets excited about you must be doing something very right!! That does look fancy! And delicious! Thanks for joining the linkup again!